Vacations in the USA mean everything from skiing down rugged mountains to sunbathing on world-famous beaches. Book a United States hotel to discover a country with a city to suit every personality and mile after mile of beautiful wilderness. A trip to the Grand Canyon is one of those once-in-a-lifetime vacations that you’re guaranteed never to forget. As well serving up some of Mother Nature’s most spectacular sights, it boasts an endless array of incredible hiking routes. For a truly awe-inspiring experience, you could always rush down the Colorado River on a raft, or perhaps take in the magic of a 2 billion year old landmark from a helicopter high above. Arizona vacations take in more than sweeping mountain vistas, ancient Native American dwellings and cowboy culture. Book a hotel in Arizona to discover otherworldly landscapes, spirit-enriching spas and cities that pulse non-stop. The main hub of activity in the Grand Canyon area is the South Rim, where Grand Canyon Village resides. While you won’t find an abundance of nightclubs or thumping bars, there’s still a quaint, easy-going nightlife to immerse yourself in. 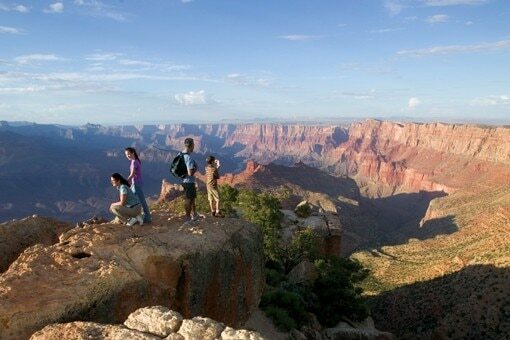 The Grand Canyon is a perfect family holiday destination. Whether you want to introduce very young kids to this eons-old natural wonder, or are traveling with older kids who love hiking and camping, the Grand Canyon region - particularly the South Rim – provides an other-worldly escape from the usual. The Grand Canyon, with its steep red and copper-colored rocky walls and ages-old canyon floor, provides endless amounts of beauty, adventure, and exploration. But when you want to discover the area’s rich cultural heritage, you won’t be let down by the Grand Canyon region’s museums, galleries, and landmarks. We're talking about an attraction more than 2 billion years old: a chasm in the Earth that reveals a prehistoric world within itself. So pretty much wherever you stay near the Grand Canyon, you're guaranteed to have an unforgettable holiday. That said, it's worth weighing up the various options to find the spot that best suits you, whether you want to be in the nearby village or in a quieter area farther afield. In addition to its status as one of the most majestic natural sights anywhere in the world, the ancient Grand Canyon and its almost alien-like surrounding areas aren’t half bad for a quick vacation splurge. Once you’ve had your fill of the sublime scenery – if that’s at all possible – and want to pick up a special keepsake, there’ll be much to choose from. The Grand Canyon is one of the world’s favorite natural wonders. A dramatic landscape unparalleled in scope and grandeur, its carved, craggy immensity lets us look into parts of the planet stretching back 2 billion years. A trip to this sublime environment can be filled with activity or relaxation. Whatever you do when you visit, whether you explore on foot, by car, on water, or even up in the clouds, you’re in for a treat. During your stay at the Grand Canyon, you’re likely to exert yourself somewhat – what with all those mesmerizing walks and climbs up to the best vantage points. What more excuse do you need to feast on local food? The national park and surrounding areas are well stocked with an eclectic range of replenishing destinations where you can chill out and stuff your face, and perhaps take in a view at the same time. Over millennia, raw elemental forces have shaped the top 10 natural wonders of the world. Whether you fancy walking on glaciers, diving the world’s largest coral reef, or exploring volcanos and waterfalls, this guide will help you choose the right hotel. The Grand Canyon meanders and stretches over 200 miles from end to end - a seemingly limitless expanse of wild and rocky natural beauty that makes for the perfect escape from hectic city life. The area is steeped in a strong Native American heritage, which can still be experienced today. For lovers of the outdoors, there’s no shortage of hiking trails, camping spots, nature walks, and white-water rafting.